I’m excited to have my friend Kim guest post today! I know you’ll love her creative ideas. Thanks for sharing with us today Kim! Hi, I’m Kim from Today’s Creative Blog. I featured Amy awhile ago when I fell in love with her many talents. You can always find something new on this site. Like many of you, now that Halloween is over, it’s a fast track on to Thanksgiving. That poor ole holiday that never gets proper attention, always getting overlooked by all the Christmas hub bub. I host Thanksgiving every year. And every year I stress. And every year I drive my husband crazy with all my stressing. I stress about having the perfect table, is the menu perfect, is all the silverware perfect, is the house perfect?………my Mother In-law and Sister In-law are impeccable house keepers……me? Not so much……seriously, how can you have a perfect home and be crafty? Or maybe I should say “how can you have a perfect home and be a busy blogger?” If you have that figured out, please let me know your secrets. Last year, I came up with the perfect solution for my table. I saw it originally in a Country Living Magazine. I took a roll of Kraft paper and rolled it out onto my table. Then I drew the placemats with a sharpie! I wrote each name next to their place setting. The plates I picked up at Walmart for $2.99 each. I mixed it up by using 2 designs. To keep the kids (and adults) from getting bored during dinner, I placed planter pots full of brand new crayons. It was relaxed and we had some pretty cool art when we were finished with our meal. It was such a hit and took off the mounting pressure, I have already decided to do it again this year. Or from another featured blogger of mine, Merriment Designs. She does wonderful tutorials and has the perfect one for my table this year. I declare this a NO FUSS Thanksgiving! Who’s with me? What a beautiful table and great ideas. Thanks for Sharing! Kinda hate to use it don’t you? LOL! Great ideas! 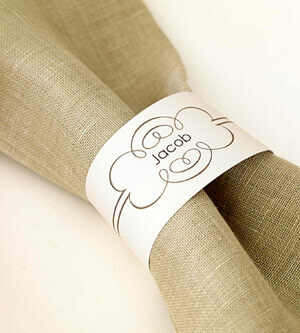 I love the printable for the napkin rings…too creative! You rock miss Kim! What a fabulous idea…and it looks great too. I love this Thanksgiving Place Setting. So fun! It’s beautiful and fun. Love it! Sharpie placemats?!? Brilliant!!! 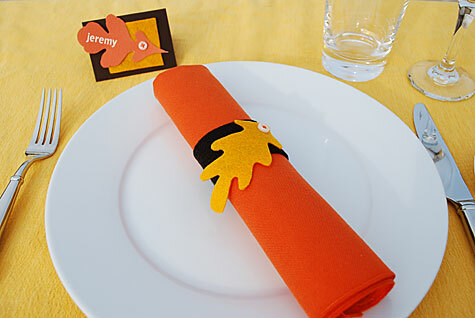 And I love those printable napkin rings. Almost enough to have Thanksgiving at my house….ALMOST! What a FUN idea Kim!! I LOVE it!! Love these ideas so much! Thanks for sharing them and maybe the Sharpie placemats and crayons will show up on my table this year.